Brid, our Landscape Designer was very excited to work on this Landscape Design Project in Weston, CT. 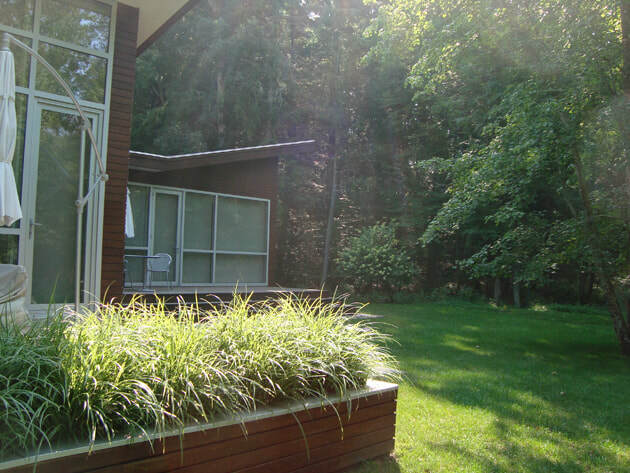 This contemporary house of glass, steel and wood is set in a low meadow surrounded by pristine wetlands and flanked by the Saugatuck river. We began work on the site immediately after construction completed. Our first challenge was to design a driveway to incorporate the lines of the house. For this purpose we used granite like paving material to reflect the native granite outcroppings found on the property. 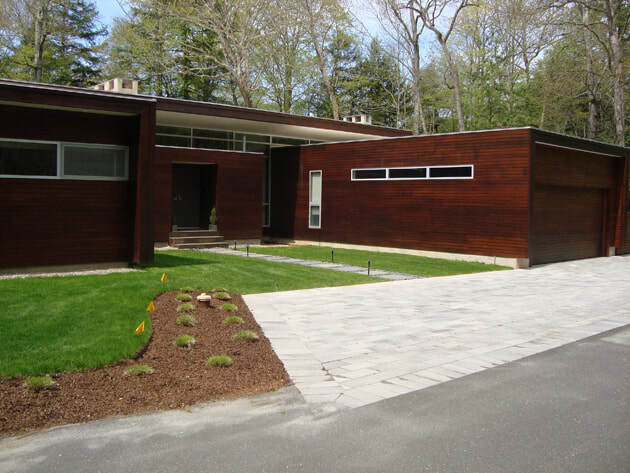 The front walk was created with classic Connecticut flagstones with the added twist of sculptural, dark gray oversize beach stones. 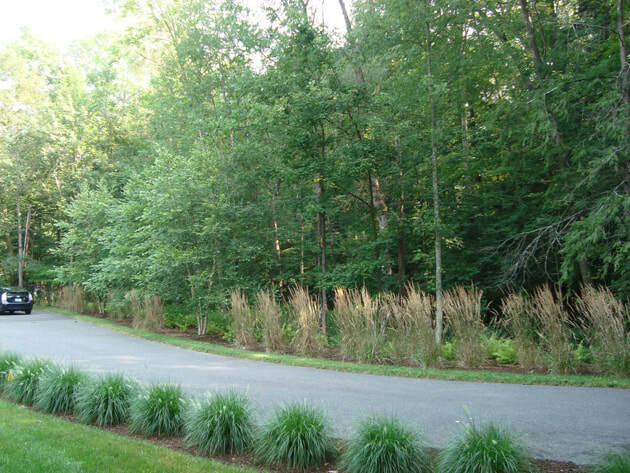 The decisions to plant the landscape with native plants and a palette of grasses echoed the plants in the landscape. These native plants set out on geometric lines connect the landscape to the house design. In 2011 hurricane Irene swept through this garden and nearly destroyed the riverbank. Moving quickly and working with Weston Conservation Commission we rebuilt the bank of the river, saving the mature and pristine woodland. Our work was challenged the following year and we are proud to say, it withstood that onslaught that hurricane Sandy brought. The riverbank was rebuilt and replanted to return it to its natural setting. Our Team was extremely happy with the end result of this Landscape Design Request in Westport, CT as we're the homeowners. This unique redesign request isn't out of the ordinary for our team. Often homeowners we work with in Westport, Wilton, Ridgefield and other parts of Fairfield County have landscape design ideas that don't necessarily fit the mold. We love to bring unique landscaping ideas and garden ideas to life! Our masonry specialists take such great pride in their work that when they get an opportunity to something other than a stone wall or patio they are thrilled. Don't worry, our stoneworkers still love creating stone walls and installing new patios or pavers. If you have a unique landscape idea simply fill out the form below to speak with our Landscape Designer on staff.